"Volunteer" redirects here. For other uses, see Volunteer (disambiguation), Voluntarism (disambiguation), and Voluntary (disambiguation). During this time, America experienced the Great Awakening. People became aware of the disadvantaged and realized the cause for movement against slavery. Younger people started helping the needy in their communities. In 1851, the first YMCA in the United States was started, followed seven years later by the first YWCA. During the American Civil War, women volunteered their time to sew supplies for the soldiers and the "Angel of the Battlefield" Clara Barton and a team of volunteers began providing aid to servicemen. Barton founded the American Red Cross in 1881 and began mobilizing volunteers for disaster relief operations, including relief for victims of the Johnstown Flood in 1889. 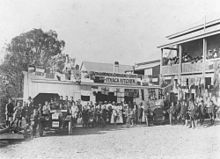 The Salvation Army is one of the oldest and largest organizations working for disadvantaged people. Though it is a charity organization, it has organized a number of volunteering programs since its inception. Prior to the 19th century, few formal charitable organizations existed to assist people in need. In the first few decades of the 20th century, several volunteer organizations were founded, including the Rotary International, Kiwanis International, Association of Junior Leagues International, and Lions Clubs International. After World War II, people shifted the focus of their altruistic passions to other areas, including helping the poor and volunteering overseas. 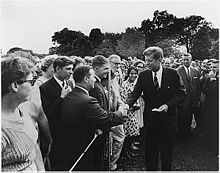 A major development was the Peace Corps in the United States in 1960. When President Lyndon B. Johnson declared a War on Poverty in 1964, volunteer opportunities started to expand and continued into the next few decades. The process for finding volunteer work became more formalized, with more volunteer centers forming and new ways to find work appearing on the World Wide Web. According to the Corporation for National and Community Service (in 2012), about 64.5 million Americans, or 26.5 percent of the adult population, gave 7.9 billion hours of volunteer service worth $175 billion. This calculates at about 125–150 hours per year or 3 hours per week at a rate of $22 per hour. Volunteer hours in the UK are similar; the data for other countries is unavailable. In 1960, after the so called revolutionary war in Cuba ended, Ernesto Che Guevara created the concept of volunteering work. It was created with the intention that workers across the country volunteer a few hours of work on their work centers. Also called e-volunteering or online volunteering, virtual volunteering is a volunteer who completes tasks, in whole or in part, offsite from the organization being assisted. They use the Internet and a home, school, telecenter or work computer, or other Internet-connected device, such as a PDA or smartphone. Virtual volunteering is also known as cyber service, telementoring, and teletutoring, as well as various other names. Virtual volunteering is similar to telecommuting, except that instead of online employees who are paid, these are online volunteers who are not paid. Micro-volunteering is a task performed via an internet-connected device. An individual typically does this task in small, un-paid increments of time. Micro-volunteering is distinct from "virtual volunteering" in that it typically does not require the individual volunteer to go through an application process, screening process, or training period. Volunteers assist survivors at the Houston Astrodome following Hurricane Katrina in September 2005. Volunteering often plays a pivotal role in the recovery effort following natural disasters, such as tsunamis, floods, droughts, hurricanes, and earthquakes. For example, the 1995 Great Hanshin-Awaji earthquake in Japan was a watershed moment, bringing in many first-time volunteers for earthquake response. The 2004 Indian Ocean earthquake and tsunami attracted a large number of volunteers worldwide, deployed by non-governmental organizations, government agencies, and the United Nations. Resource poor schools around the world rely on government support or on efforts from volunteers and private donations, in order to run effectively. In some countries, whenever the economy is down, the need for volunteers and resources increases greatly. There are many opportunities available in school systems for volunteers. Yet, there are not many requirements in order to volunteer in a school system. Whether one is a high school or TEFL (Teaching English as a Foreign Language) graduate or college student, most schools require just voluntary and selfless effort. Much like the benefits of any type of volunteering there are great rewards for the volunteer, student, and school. In addition to intangible rewards, volunteers can add relevant experience to their resumes. Volunteers who travel to assist may learn foreign culture and language. Volunteering in schools can be an additional teaching guide for the students and help to fill the gap of local teachers. Cultural and language exchange during teaching and other school activities can be the most essential learning experience for both students and volunteers. Benefacto, a volunteering brokerage, describe corporate volunteering as "Companies giving their employees an allowance of paid time off annually, which they use to volunteer at a charity of their choice." According to the information from VolunteerMatch, a service that provides Employee Volunteering Program solutions, the key drivers for companies that produce and manage EVPs are building brand awareness and affinity, strengthening trust and loyalty among consumers, enhancing corporate image and reputation, improving employee retention, increasing employee productivity and loyalty, and providing an effective vehicle to reach strategic goals. In April 2015, David Cameron pledged to give all UK workers employed by companies with more 250 staff mandatory three days’ paid volunteering leave, which if implemented will generate an extra 360 million volunteering hours a year. 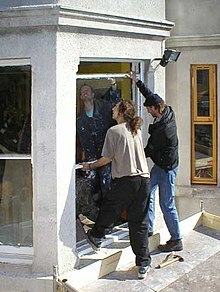 Volunteers fit new windows at the Sumac Centre in Nottingham, England, UK. Community volunteering, in the US called "community service", refers globally to those who work to improve their local community. This activity commonly occurs through not for profit organizations, local governments and churches; but also encompasses ad-hoc or informal groups such as recreational sports teams. There are many proven personal benefits of community volunteerism. Working together with a group of people who have different ethnicity, backgrounds, and views reduces stereotypes. Community volunteerism has also been proven to improve student's academic success. According to Where's the Learning in Service Learning? by Janet Eyler and Dwight E. Giles, immersing oneself into service learning and serving others has many positive effects both academic and personal. Not only does surrounding oneself with new people and learning how to work together as a group help one improve teamwork and relational skills, it reduces stereotypes, increases appreciation of other cultures, and works to allow young people to find others that they relate to. Eyler and Giles noted that at the beginning and end of a college semester that included three hours of community service a week, students reported a much higher regard for cultural differences. At the end of the semester those who had participated in service-learning were noted as saying that the most important things that they had learned were not to judge others, and to appreciate every type of person because everyone shares some similar key characteristics. Community volunteer work has proven to be a powerful predictor in students' academic lives and college experience as a whole. Studies have shown that students who participate in community service as a part of their college course of study have a much higher correlation of completing their degree (Astin, 1992; Pascarella and Terenzini, 1991). In addition, college students who participate in community volunteer projects as a part of their college experience report finding a much greater relevance in their academic studies after completing community volunteer projects. According to University Health Services, studies have found that volunteering can positively impact a student’s overall mental and emotional health. In some European countries government organisations and non-government organisations provide auxiliary positions for a certain period in institutions like hospitals, schools, memorial sites and welfare institutions. The difference to other types of volunteering is that there are strict legal regulations, what organisation is allowed to engage volunteers and about the period a volunteer is allowed to work in a voluntary position. Due to that fact, the volunteer is getting a limited amount as a pocket money from the government. An organization having one of the biggest manpower in Europe is the German Federal volunteers service (Bundesfreiwilligendienst), that was founded in 2011, by having more than 35.000 federal volunteers in 2012. A much older institution is the Voluntary social year (Freiwilliges Soziales Jahr) in Austria and Germany. Sochi Olympics 25,000 volunteers worked at the 2014 Sochi Winter Olympics. They supported the organisers in more than 20 functional areas: meeting guests, assisting navigation, organising the opening and closing ceremonies, organising food outlets, etc. Volunteer applications were open to any nationals of Russia and other countries. The Sochi 2014 Organising Committee received about 200,000 applications, 8 applicants per place. Volunteers received training over the course of more than a year at 26 volunteer centres in 17 cities across Russia. The majority of participants were between 17 and 22 years old. At the same time, 3000 applications were submitted from people over 55 years old. Some of them worked as volunteers during the 1980 Olympics in Moscow. It was the first experience with such a large-scale volunteer program in the contemporary Russia. For the first time in its history, Russia will host the FIFA World Cup from 14 June till 15 July 2018. Moreover, it will be the first time the World Cup games will be played both in Europe and Asia. The games will be hosted by 12 stadiums in 11 Russian cities. The volunteer program of the 2018 FIFA World Cup has engaged thousands of people from Russia and other countries around the world. The program included several stages: recruitment, selection and training of volunteers, organisation of their work during the championship. The recruitment of volunteers for the FIFA Confederations Cup and the FIFA World Cup via FIFA.com started on 1 June 2016 and closed on 30 December 2016. Some of the volunteers worked at the 2017 FIFA Confederations Cup: 1733 people assisted the organisers in Saint Petersburg, 1590 worked in Moscow, 1261 in Sochi, 1260 in Kazan, a total of 5844 participants. The FIFA World Cup will be supported by 17,040 volunteers of the Russia 2018 Local Organising Committee. Candidates living in Russia were selected by 15 volunteer centres in the host cities based in some of Russia's leading higher educational institutions: Synergy University, Moscow State Institute of International Relations, Plekhanov Russian University of Economics, Russian State Social University, Moscow Automobile and Road Construction University, Saint Petersburg State University of Economics, Samara State University, Volga Region State Academy of Physical Culture, Sport and Tourism, Don State Technical University, Ogarev Mordovia State University, Volgograd State University, State University of Nizhny Novgorod, Samara State Aerospace University, Immanuel Kant Baltic Federal University, and Ural Federal University. Candidates from other countries were selected remotely. Candidates had to be at least 18 years old, have a good knowledge of English, have a higher or vocational secondary education, and possess teamwork skills. Volunteers were trained remotely, in volunteer centres and at World Cup venues. Organising the opening and closing ceremonies of the championship. Their work started ahead of the events: on 10 May 2017 for the 2017 FIFA Confederations Cup, and on 10 May 2018 for the 2018 FIFA World Cup. On 20 October 2017, the Russian National Competition of Important Social Projects "Legacy of 2018 FIFA World Cup Volunteer Program" was launched. The competition has engaged about 1500 people: applicants to the 2018 FIFA World Cup volunteer program and future city volunteers. The idea of the competition was that anyone could submit a project that would draw the attention of Russian cities residents to the FIFA World Cup in Russia and leave a legacy after the championship was over. The project was expected to produce tangible (work of art, place of attraction for guests and residents in the city, open playground, graffiti, developed areas in city parks, films, etc.) or intangible (events, conferences, festivals, exhibitions) legacy. 26 projects qualified to the final and were supported by the Russia 2018 Local Organising Committee and the host cities of the 2018 FIFA World Cup. The jury included the General Director of the Russia 2018 Local Organising Committee Alexey Sorokin, Ambassador of the 2018 FIFA World Cup in Russia Alexey Smertin and Advisor to the Head of the Federal Tourism Agency Svetlana Sergeeva. Some of the projects were combined or further developed by the Local Organising Committee. Among the projects were: Football Championship for Moms, Ramp Production out of Recycled Plastic, Your Championship Sticker Packs, etc. Modern societies share a common value of people helping each other; not only do volunteer acts assist others, but they also benefit the volunteering individual on a personal level. Despite having similar objectives, tension can arise between volunteers and state-provided services. In order to curtail this tension, most countries develop policies and enact legislation to clarify the roles and relationships among governmental stakeholders and their voluntary counterparts; this regulation identifies and allocates the necessary legal, social, administrative, and financial support of each party. This is particularly necessary when some voluntary activities are seen as a challenge to the authority of the state(e.g., on 29 January 2001, President Bush cautioned that volunteer groups should supplement—not replace—government agencies’ work). Volunteering that benefits the state but challenges paid counterparts angers labor unions that represent those who are paid for their volunteer work; this is particularly seen in combination departments, such as volunteer fire departments. Some international volunteer organizations define their primary mission as being altruistic: to fight poverty and improve the living standards of people in the developing world, (e.g. Voluntary Services Overseas has almost 2,000 skilled professionals working as volunteers to pass on their expertise to local people so that the volunteers' skills remain long after they return home). When these organizations work in partnership with governments, the results can be impressive. However, when other organizations or individual First World governments support the work of volunteer groups, there can be questions as to whether the organizations' or governments' real motives are poverty alleviation. Instead, a focus on creating wealth for some of the poor or developing policies intended to benefit the donor states is sometimes reported. Many low-income countries’ economies suffer from industrialization without prosperity and investment without growth. One reason for this is that development assistance guides many Third World governments to pursue development policies that have been wasteful, ill-conceived, or unproductive; some of these policies have been so destructive that the economies could not have been sustained without outside support. Indeed, some offers of aid have distorted the general spirit of volunteering, treating local voluntary action as contributions in kind, i.e., existing conditions requiring the modification of local people’s behavior in order for them to earn the right to donors’ charity. This can be seen as patronizing and offensive to the recipients because the aid expressly serves the policy aims of the donors rather than the needs of the recipients. Based on a case study in China, Xu and Ngai (2011) revealed that the developing grassroots volunteerism can be an enclave among various organizations and may be able to work toward the development of civil society in the developing countries. The researchers developed a "Moral Resources and Political Capital" approach to examine the contributions of volunteerism in promoting the civil society. Moral resource means the available morals could be chosen by NGOs. Political capital means the capital that will improve or enhance the NGOs’ status, possession or access in the existing political system. Moreover, Xu and Ngai (2011) distinguished two types of Moral Resources: Moral Resource-I and Moral Resource-II (ibid). Moral Resource I: Inspired by Immanuel Kant’s (1998 ) argument of "What ought I to do," Moral Resource-I will encourage the NGOs’ confidence and then have the courage to act and conquer difficulties by way of answering and confirming the question of "What ought I to do." Moral Resource II: given that Adorno (2000) recognizes that moral or immoral tropes are socially determined, Moral Resource-II refers to the morals that are well accepted by the given society. Political Capital-I refers to the political capital mainly ascribed to the status that the NGO inherited throughout history (e.g., the CYL). Political Capital-II refers to the Political Capital that the NGOs earned through their hard efforts. Obviously, "Moral resource-I itself contains the self-determination that gives participants confidence in the ethical beliefs they have chosen", almost any organizations may have Moral Resource-I, while not all of them have the societal recognized Moral Resource-II. However, the voluntary service organizations predominantly occupy Moral Resource-II because a sense of moral superiority makes it possible that for parties with different values, goals and cultures to work together in promoting the promotion of volunteering. Thus the voluntary service organizations are likely to win the trust and support of the masses as well as the government more easily than will the organizations whose morals are not accepted by mainstream society. In other words, Moral Resource II helps the grassroots organizations with little Political Capital I to win Political Capital-II, which is a crucial factor for their survival and growth in developing countries such as China. Therefore, the voluntary service realm could be an enclave of the development of civil society in the developing nations. Volunteering has the ability to improve the quality of life and health including longevity of those who donate their time  and research has found that older adults will benefit the most from volunteering. Physical and mental ailments plaguing older adults can be healed through the simple act of helping others; however, one must be performing the good deed from a selfless nature. There are barriers that can prevent older adults from participating in volunteer work, such as socio-economic status, opinions held by others, and even current health issues. However, these barriers can be overcome so that if one would like to be involved in volunteer work they can do so. Volunteering improves not only the communities in which one serves, but also the life of the individual who is providing help to the community. Volunteering is known not only to be related to happiness  but also to increase happiness . Also, giving help was a more important benefit of better reported mental health than receiving help . Studies have also shown that volunteering can cause a decrease in loneliness for those volunteering as well as those for whom people volunteer. In the United States, statistics on volunteering have historically been limited, according to volunteerism expert Susan J. Ellis. In 2013, the U.S. Current Population Survey (US) included a volunteering supplement which produced statistics on volunteering. In the 1960s, Ivan Illich offered an analysis of the role of American volunteers in Mexico in his speech entitled "To Hell With Good Intentions". His concerns, along with those of critics such as Paulo Freire and Edward Said, revolve around the notion of altruism as an extension of Christian missionary ideology. In addition, he mentions the sense of responsibility/obligation as a factor, which drives the concept of noblesse oblige—first developed by the French aristocracy as a moral duty derived from their wealth. Simply stated, these apprehensions propose the extension of power and authority over indigenous cultures around the world. Recent critiques of volunteering come from Westmier and Kahn (1996) and bell hooks (née Gloria Watkins) (2004). Also, Georgeou (2012) has critiqued the impact of neoliberalism on international aid volunteering. The field of the medical tourism (referring to volunteers who travel overseas to deliver medical care) has recently attracted negative criticism when compared to the alternative notion of sustainable capacities, i.e., work done in the context of long-term, locally-run, and foreign-supported infrastructures. A preponderance of this criticism appears largely in scientific and peer-reviewed literature. Recently, media outlets with more general readerships have published such criticisms as well. ^ Wilson, John (2000). "Volunteering". Annual Review of Sociology (26): 215. doi:10.1146/annurev.soc.26.1.215. Retrieved 12 April 2017. ^ "Benefits of Volunteering". Corporation for National and Community Service. Retrieved 12 April 2017. ^ a b Harper, Douglas. "volunteer". Online Etymology Dictionary. ^ "Volunteer- what's in a word?". Jocote.org. 23 December 2010. Archived from the original on 27 December 2010. ^ a b c Warburton, Jeni; Oppenheimer, Melanie (2000). Volunteers and Volunteering. The Federation Press. ISBN 1-86287-376-3. ^ a b "Service Learning". Medical Education at Harvard. Harvard College. 2010. ^ "Need of skills based volunteering for Non-Profit activities". National Service Resources. ^ "Skills based volunteering". Independent Sector. ^ "What to Consider". BMA. 7 December 2018. ^ "Online Volunteering". UN Volunteers. Archived from the original on 2 May 2012. Retrieved 30 April 2012. ^ "Virtual Volunteering Resources". Service Leader. Archived from the original on 6 May 2012. Retrieved 30 April 2012. ^ Fritz, Joanne. "Micro-Volunteering via Mobile Phones - Using Spare Time to Micro-Volunteer". About.com. Archived from the original on 21 April 2009. ^ "Micro Volunteering - Changing The World In Just Your Pyjamas!". I-volunteer.org.uk. Retrieved 17 September 2013. ^ "USGS Tsunami 2004 Summary". United States Geological Survey. Archived from the original on 19 January 2011. Retrieved 11 September 2017. ^ Power, Matthew (April 2005). "The Tsunami Volunteers". National Geographic Adventure Magazine. Archived from the original on 18 February 2012. ^ "The Economy's Impact on Back to School". Great Schools. 6 August 2009. Retrieved 20 November 2009. ^ a b "Volunteer teaching effort can help students to learn better in schools" (PDF). School Mental Health Project. Retrieved 14 December 2011. ^ Darlington, Ben (9 February 2016). "What is Corporate Volunteering?". Benefacto. ^ "Mapping Success in Employee Volunteering - The Drivers of Effectiveness for Employee Volunteering and Giving Programs and Fortune 500 Performance (2009)". Boston College Center for Corporate Citizenship 2009. Retrieved 21 April 2010. ^ "Fortune 500's monetary donation programs for voluntary service". Qgiv.com. Retrieved 7 March 2012. 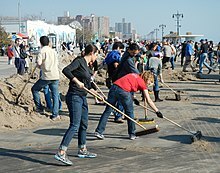 ^ "Does Employee Volunteerism Work?". VolunteerMatch.org. Archived from the original on 28 May 2010. ^ Winfield, Mark. The Essential Volunteer Handbook. FriesenPress. ISBN 978-1-4602-1583-8. ^ Astin, A.W. (1992). What Matters in College: Four Critical Years Revisited. San Francisco: Jossey-Bass. ^ Pascarella and Terenzini, E.T. and P.T. (1991). How College Affects Students: Findings and Insights from Twenty Years of Research. San Francisco: Jossey-Bass. ^ Eyler and Giles, Jr., Janet and Dwight (1999). Where's the Learning in Service-Learning. San Francisco: Jossey-Bass. ^ "Student volunteering could have health benefits". www.uhs.wisc.edu. Retrieved 9 August 2018. ^ FIFA.com. "Чемпионат мира по футболу FIFA 2018 в России™ - Волонтерская программа Чемпионата мира по футболу FIFA 2018 в России™ - FIFA.com". www.fifa.com (in Russian). Retrieved 14 June 2018. ^ FIFA.com. "Чемпионат мира по футболу FIFA 2018 в России™ - Новости - Победители конкурса «Наследие волонтерской программы ЧМ-2018» награждены в «Сколково» - FIFA.com". www.fifa.com (in Russian). Retrieved 14 June 2018. ^ "Aid, taxation, and development: analytical perspectives on aid effectiveness in Sub-Saharan Africa". World Bank. 28 February 1998. Retrieved 12 July 2007. ^ a b Xu, Y; Ngai, N. P. (2011). "Moral Resources and Political Capital: Theorizing the Relationship Between Voluntary Service Organizations and the Development of Civil Society in China". Nonprofit and Voluntary Sector Quarterly. pp. 247–269. Retrieved 17 April 2011. ^ Kant, I. (1998). Critique of pure reason (J. M. D. Meiklejohn, Trans.). Raleigh, NC: Alex Catalogue. ^ Adorno, T. (2000). Problems of moral philosophy (T. Schroder, Ed. & R. Livingstone, Trans.). Stanford, CA: Stanford University Press. ^ Blau, P. M., & Duncan, O. D. (1967). The American occupational structure. New York: Wiley. ^ Xu, Y; Ngai, N. P. (2011). "Moral Resources and Political Capital: Theorizing the Relationship Between Voluntary Service Organizations and the Development of Civil Society in China". Nonprofit and Voluntary Sector Quarterly. p. 260. Retrieved 17 April 2011. ^ a b Aknin, LB; Barrington-Leigh, CP; Dunn, EW; Helliwell, JF; Burns, J; Biswas-Diener, R; Kemeza, I; Nyende, P; Ashton-James, CE; Norton, MI (2013). "Prosocial spending and well-being: Cross-cultural evidence for a psychological universal" (PDF). Journal of Personality and Social Psychology. 104 (4): 635–652. doi:10.1037/a0031578. ^ "Why Helping Others Makes Us Happy | Dr. Barbara Edwards". Retrieved 11 June 2018. ^ "Wouldn't It Be Nice to Really Know | Energize: Volunteer Management Resources for Directors of Volunteers". www.energizeinc.com. Retrieved 12 October 2016. ^ "National Veteran Corps". www.volunteeringinamerica.gov. Retrieved 12 October 2016. ^ Roberts, M. (2006). Duffle Bag Medicine. Journal of the American Medical Association, 295, 1491-1492. ^ Pinto, A.D., & Upshur, R.E.G. (2009). Global Health Ethics for Students. Developing World Bioethics, 9, 1-10. ^ "Think looking after turtles in Costa Rica for three weeks is good for your CV? Think again". The Conversation. 4 November 2016. Retrieved 11 November 2016. ^ McGuinness, F.; Ward, M. (2017). State of the Nation Report by the Social Mobility Commission (PDF) (Report). ^ Walker, Mark (2018). "'Own Transport Preferred': Potential problems with long-term volunteering and internships". ECOS. Look up volunteering in Wiktionary, the free dictionary. Wikimedia Commons has media related to Volunteering.